Celebrating the magazine’s anniversary, we decided to present a much more deeper perspective to our readers. We know it’s hard to maintain a business and we surely understand what it takes to accomplish your dreams. So, this article is dedicated to all of you who have a dream and long for constant encouragement, facing daily struggles and hardships that may seem unbeatable. The above quote was the exact words of Chris Gardner, a struggling single dad who presented a lesson to the entire world. He knew the true meaning of failure and how it wrecks a person inside out, yet he chose not to give in, nor to surrender to such chaos of obstacles. He knew exactly what he wanted to do and he went for it. This month’s character is not supposedly real; in fact, it is all you have to learn from this man to be realistically genuine! Back in 1981, Gardner invested all his family savings in a device known as a ‘Bone Density scanner,’ an apparatus twice more expensive than X-ray with practically the same resolution. Unfortunately, the device financially broke the family and his wife decided to leave him. Determined as ever, he took custody of his only child, Christopher, and saw the chance in fighting for a Stockbroker internship position at Dean Witter in San Francisco. Living through a brutally competitive training period without any salary, along with other twenty candidates, changed him forever. By then, he got homeless after being evicted several times, which led him to live on the streets, crash in few homeless shelters, or even steal some hours of sleep at the bathroom of a subway station. With self-confidence, determination, and positivity, Chris Gardner became a Wall Street legend and a millionaire. He is now the Founder & CEO of his own company, Gardner Rich & Co. Imagine yourself in such a severe situation where you lose your income, your home, your life partner, and above all you are totally alone with no support from anyone what so ever. What would you do? Would you walk around and beg for money? Would you feel lost and turn into a suicidal? Or, alternatively, will you decide to get a grip on your life? Chris Gardner powerfully stated, “We were homeless, but we were not hopeless. There’s a major difference!” Put yourself in his shoes, even take the time to watch the movie or read the book, so you can grasp how he managed to survive it all. You’ll be surprised how many lessons you can obtain from such a story. Give yourself a chance to interact with the situation and ask yourself, what would you do if you were living his life? “It was a choice: you eat or you stay at a hotel. We chose to eat, we stayed in a subway station, we rode the trains, and we slept in bathrooms,” that’s what Chris chose to do. Now, what about you? Will you simply give up or will you take over? Despite anger and resentment, there’s always a brand new day. No matter how much you feel neglected or mistreated; there are always people who live far more worse than you do. Who said you should quit? Who said that’s the end of all things? It’s always your mind that is in control; not me, not the people who surround you, and certainly not those who provide your monthly cash. The true meaning of living is determined by how much intellectual you are. It’s how you learn to pass on the knowledge you have, it’s how you should be responsible of your own actions, it’s when you look ahead and feel the exact meaning of gratitude… It’s knowing you made the right decision and feeling proud about it, it’s when you truly draw the line if someone took you for granted, it’s when you learn to accept your misfortunes and endure it all… it’s simply when you stand up for yourself. Just don’t waste any more time; acknowledge your own ‘Pursuit of Happiness’ and get done with it already! 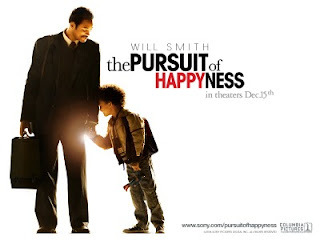 Note: Check this website: http://www.chrisgardnermedia.com, if you’re interested to know more about Chris Gardner. Amazing, very invigorating. It fueled me with eagerness and sustained my faith that sometimes gets diminished. Do you write in a magazine? Tell me about it please :). Yeah, It's called "Beyond" as I stated at the end ..